You make a dozen decisions a day. Big ones like what your sermon series should be in the fall. Or little ones like who to have lunch with. Or what to do after you read this article. How do you know what’s the right decision? What moves your church forward? What’s wasting time? It’s easy to forget how long it’s been since your last prayer retreat. I know why not to go. It’s hard on your family for you to get away. It costs money. It takes time that you don’t have. My friend Paul Becker is the founder and president of Dynamic Church Planting International. He takes prayer retreats, um, religiously. God has used those retreats, and Paul’s willingness to listen and obey, to call DCPI to equip church planters to plant 5 million churches around the world. That’s a God-inspired, prayer retreat fueled, BHAG. I don’t know if God would be using DCPI, or Paul’s life, in the same way if Paul wasn’t so faithful to get away to pray and listen. Take an overnight prayer retreat quarterly. Two nights is better. Find a place to stay that doesn’t cost much. Borrow the second home of a church member or find a nearby Christian camp that allows pastors to stay midweek for a pittance. Help your spouse understand why it’s important for you to get away to pray. And make it up to her by giving her time away, too: for a visit home, time with friends, or her own prayer retreat. Prepare for your prayer retreat by planning ahead what you hope to do. Plan to slow down, take a nap, read the Bible, and wrestle like Jacob before the Lord, if necessary. Watch this video from James Ryan, the Dean of Harvard’s School of Education. He’s speaking to future educators in this 2016 Commencement speech, not to pastors. And he’s not speaking from a particularly Christian world-view, but his questions are valid questions for anyone to ask if you want to live your life strategically and significantly. And at the meta-perspective, he’s teaching us to be leaders who ask questions. To be thoughtful. To examine. Wait. What? To ask for clarification. For understanding. I wonder why? I wonder if? To be curious. To see how you can improve. Couldn’t we at least? To get unstuck or get started. For progress. How can I help? To offer help with humility. For good relationships. What truly matters? What truly matters to me? To get to the heart of issues, to the heart of your convictions. And the Bonus Question: Did you get what you wanted out of life, even so? 3. Be strategic about your day. Every day pick six, and only six, things that need to be done. Label the most important thing #1, then work on down your list, prioritizing tasks two through six. Now, work on the first thing until it’s done. Then work on the second thing until it’s done. Then the third, then the rest. If it’s a big project, you won’t plan for it to get done done. Just know how far you want to get today and get that done. At the end of the day, you will know that you got the most important things done and spent your time in the most effective way. What didn’t get done goes on to the next day. Or maybe it falls off your list. Strategic planning pro’s say that you should spend 60-80% of your time on routine work, and the rest on the special projects that move your organization forward. What’s in the 20-40% of your workday, the 1 or 2 items on your list, that are the special projects to work ON your church, not the routine work that keeps church running? 4. Pursue systems and processes, not events. It’s not enough to fill up the church calendar with weekend services, women’s events, Bible studies, or VBS. You know that I-might-be-flying-off-the-treadmill-at-any-moment feeling. So do your church members. Instead, everything your church does should have a reason and a place in your mission and vision. Most events fit in a process or system in your church, so it’s just a matter of clarifying that the purpose of the event is not the event itself. 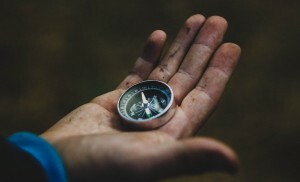 Here’s an article that walks you through recognizing how your church events fit together into your spiritual growth process. It may take a prayer retreat, and some leadership meetings, to see how your programming fits together strategically to reach your community and to develop disciples. You just need to think about it, work on it some, and then talk about your events differently. You may know in your heart that some events should die a peaceful death because they don’t fit in any process, but that’s a-whole-nother kettle of fish. Just be prayerful about that today. Everything your church does should have a reason behind it. 5. Choose big impact improvements. No need to spin your wheels on improvements that don’t really make a difference. Strategic pastors focus on improvements that give them the most return on their effort. 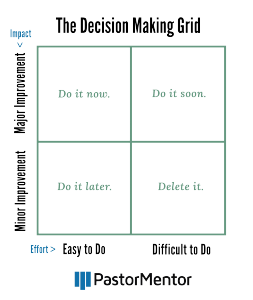 The Decision-Making Grid, also called the Eisenhower Box because it was President Eisenhower’s thing, sorts your options into high/low effort and high/low impact. Strategic pastors skip the minor improvement projects and back the project that makes major improvements. Use an evaluation process to see where your church can get better. Then identify some things that are easy to do and will make a big impact on your church’s growth and effectiveness. And pick one thing that is hard to do but will make a big impact in your church. Like bringing one of your church’s systems to the next level. Strategic pastors don’t dink around doing things that don’t matter. You focus on getting important things done. 6. Get input from others. Plans are established by seeking advice, so if you wage war, obtain guidance. We are waging war. 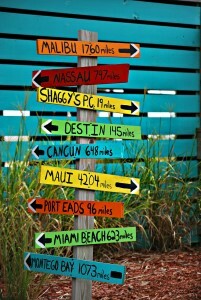 Where are you getting guidance? From your Association Leaders? From other pastors? Your Board? Your wife? Those are all good advisors. I have a mentor every year, too. It took me a long time to humble myself enough to admit that I need a mentor. Now I have no problem hiring a coach who can help me make wise decisions, who has been where I want to go, who can sort through all the noise. Mentors help me grow as a strategic leader. Side Note: I work with a few pastors each year, mentoring them individually or through my online mentoring program, ChurchEngines. Pick one other action item from this list that will help you be a more strategic pastor. Is ChurchEngines right for me?